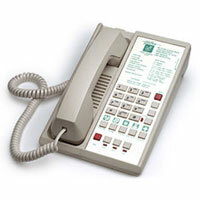 We offer the complete line of Teledex Hotel Phones. From the budget oriented Nugget phones to the Diamond, Diamond 2-Line and Opal series, the Millennium, and Cordlessseries hotel phones, Telephone Magic has the best selection of Teledex Hotel Phones. More hotels worldwide use Teledex Diamond phones than any other guestroom phone. A timeless design and easy user interface make the Diamond a sure bet for any property. Single-line guestroom speakerphone with ten (10) programmable guest service buttons, mute, hold, conference, redial, EasyAccess data port, message waiting light, ExpressNet-ready, ADA compliant. Covered by the Teledex lifetime warranty. Line Powered, does not require external power. More hotels worldwide use Teledex Diamond phones than any other guestroom phone. A timeless design and easy user interface make the Diamond a sure bet for any property. Single-line guestroom speakerphone with five (5) programmable guest service buttons, mute, hold, conference, redial, EasyAccess data port, message waiting light, ExpressNet-ready, ADA compliant. Covered by the Teledex lifetime warranty. More hotels worldwide use Teledex Diamond phones than any other guestroom phone. A timeless design and easy user interface make the Diamond a sure bet for any property. Two-line guestroom telephone with zero (0) programmable guest service buttons, hold, conference, redial, EasyAccess data port, message waiting light, ExpressNet-ready, ADA compliant. Covered by the Teledex lifetime warranty. The telephone in use in more hotel rooms than any other product. 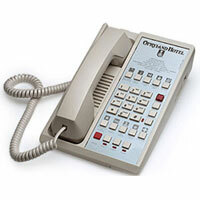 Diamond telephones continue to offer superior features and quality for all hotel brands.